Quadcopters are becoming a very popular option for flying your own drone. Most of them, but not all, offer a built in video camera for giving your drone some eyes. However, if you want a quality camera, or live video feed to your controller, you usually must pay a premium. Not everyone can afford to pay hundreds of dollars. "Eye of the Drone" is a project aimed at using your smartphone as the ultimate sensor package for your drone. A smartphone can be utilized to capture pictures, video, sound, acceleration, GPS coordinates, and other useful data. With a built in cellular connection, smartphones are the perfect mechanism to transform all of this data real time to Azure storage. From there, a user can see the data through a web site or application. 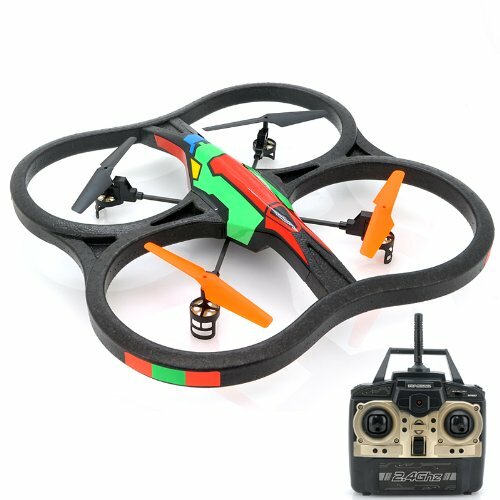 Perhaps most importantly, by taking advantage of the smartphone you probably already own, you can save hundreds of dollars by focusing on buying a quadcopter that is built for one thing, flying. This all started when my father in law expressed some interest in getting a drone. But he was mostly joking because he felt they must be too expensive for regular people to get. I started showing him some models on Amazon for less than $100. He was amazed they could be had for so cheap. But I quickly noticed that you had to pony up several hundred dollars if you wanted a quadcopter with a good camera that could transmit live video feed. So I wondered if it would be practical to strap your phone to one of these and have to be the eyes and ears of your quadcopter. The more I thought about it, the more I thought it could actually be a good idea. Not only could you capture video with your phone, but you could capture GPS data and you could even upload all of this real time since the phone will probably have a cellular connection. I was actually already planning on making this project when I saw this contest. I thought this could be a perfect demo of an IoT based app utilizing Azure to connect users to a "thing" (in this case, a Quadcopter drone). For my demo, I plan to build a Windows Phone 8.1 application that runs on the smartphone while it is being carried by the Quadcopter. The client app will periodically gather GPS coordinates and images. If an internet connection is detected, the app will upload that data real time to an Azure mobile service. Otherwise, utilizing the Offline Sync capability of Azure Mobile Services, the app will store the data on local storage and sync with the cloud when a future connection is established. To view your data, I plan to create a website and a Windows 8.1 / WP8.1 universal app. They will show a Bing Map control that plots the path your quadcopter has taken. The site and app will also show pictures taken by the phone. Storing a users data on the server and letting them view the data in client applications will require some type of account management and authentication. Rather than have users go through the trouble of creating their own accounts, we will utilize OAuth. Using OAuth, users can sign in with a 3rd party account, such as Facebook, Microsoft, or Google. For the purposes of this demo, I will also use CodeProject as an option for authentication. Taking Pictures: For our demo, we will use the Universal apps API's for taking pictures and video. First, open the Package.appxmanifest of the phone project. Under Capabilities, check Webcam, Pictures Library, and Videos Library. Webcam allows our app access to the camera or webcam of the device to capture pictures and record videos. The picture and video library capabilities will allow us to save files to the users phone library. Under Requirements, make sure that Rear Camera is selected. In my XAML, I add a CaptureElement called capturePreview to show the view of the camera. I also add a Image called capturePost to show the pictures that are taken. For this demo, I'm inlcuding a button to fire pictures off manually, but the final app will fire off pictures on a timer or web call. InitPreview will set the capturePreview CaptureElement source to the camera. Tie the button to an asyc takePicturesBtn_Click event. Create a file in local storage with a random Guid name to ensure its unique. Use CapturePhotoToStorageFileAsync to capture the picture to that file. Note that you can also capture an image to a stream, which might be useful latter. Now create a BitmapImage and set its stream to our local file. Load that BitmapImage to the Image control in the XAML to show the user. Tracking GPS: For our demo, we will use the Windows Phone APIs for tracking GPS and displaying a simple map control that centers on the phones position. At the moment, the phone APIs and Windows 8 APIs are slightly different. Hopefully when Windows 10 launches, these will be more unified. First, open the Package.appxmanifest of the phone app project. Under Capabilities, check Location. This lets the phone OS know that your app is requesting access to the users location. Here is the basic set of code I use to get the users Location and update a map control on the phone itself. The map control isn't necessary since this will just be the pilot app, but it's good for debugging. To test out the code, let's use location features in the WP8.1 emulator. On the emulator, click the double arrows >> on the right side toolbar. That will expand out your advanced emulator features. Click on the Location tab. Zoom into some area you want to pretend your phone is at. Let's create a route. On the top bar, there is a dropdown for "Live, Pin, Route". Select route. Click on the map once you create your starting point. Click again for your ending point. You will see driving based directions created. Click the play arrow next to the speed drop down to start the route. This is a great way to test any location based app! Authentication: For our demo, we will use CodeProject API and OAuth to let the user authenticate with their CodeProject account. The following code uses the sample from https://api.codeproject.com/Samples/ResourceOwnerCsDoc to handle authentication from the WP8.1 app that gathers data, and the client WP8.1/W8.1 universal app for viewing the data from the server. Basically, the user will enter their email and password into the application. We use that information to get an access token from Code Project through a HttpClient web call. Part of the information we can get back is the users MemberId. This will be used as the unique ID to tie the users data to their account. So when the phone app is uploading media and GPS data to the server, that data will be tied to the MemberId of their CodeProject account. When the user logs onto a client app with their CodeProject credentials, the server will give them data that's associated with their MemberId. // this will hold the MemberId returned from the server. This whole section will be devoted to explaining how I utilize Azure Mobile Services to tie everything together. The old code runs Refresh once. My new code simply runs the refresh operation on a loop and updates the button text to let you know how many times its running. I ran the new code in two emulators. What I found with this experiment surprised me. It seems that simple polling of the Mobile Service will let us get updates roughly every 1/10th a second. This resulted in a near real time experience. At least for our application its near enough. So call me lazy, but I'll go with this. If latency becomes an issue I will investigate switching to SignalR. Now go to your mobile service, select the Configure tab, and add the STORAGE_ACCOUNT_NAME and STORAGE_ACCOUNT_ACCESS_KEY values to the app settings section. In your solution, add WindowsAzure.Storage NuGet package to all your projects. In the service, add the following lines to your webconfig. In the PictureItemController.cs, edit the PostPictureItem call. // Set the BLOB store container name on the item, which must be lowercase. // Define a policy that gives write access to the container for 5 minutes. // Get the SAS as a string. // Set the URL used to store the image. In the Pilot.xaml.cs class, add this code to takePictureBtn_Click event. // you are able to upload multiple streams using the same container credentials. This will create your Picture Item and upload the picture to the Azure Storage container. To View the data, we have a universal XAML page called DroneDashboard.xaml that shows the pictures and locations of the drone session. Here is the code for the refresh method. The original goal of my app was to provide live video feed. However, at the moment, I haven't been able to find example code for Windows Phone for uploading a live video stream to an online service. I'm sure it's technically possible since there are some webcam type applications. But for the sake of time, I'll focus on uploading GPS coordinates and periodic picture shots and displaying this data in a website and a client application. I hope to finish in time to take another shot at the live video feed. A future goal of my project is to also figure out a way to send commands from the smartphone to a quadcopter. Figuring that out would open up the possibility of flying the quadcopter out of range of the controller. The Quadcopter I am purchasing is this model from Amazon. At $70, it looks plenty big enough and even comes with a bucket type accessory for carrying the smartphone. 2/19/2015: Added instructions and code for authenticating with a users' CodeProject account. This is how we will tie their data to their account. 3/22/2015: Added intro to capture images. 3/31/2015: Final write up and code submission for contest. Unfortunately my code is still a work in progress at the moment. But I plan on continuing to edit this article as I progress. This is fantastic! Microsoft just launched a new campaign to feature cool projects created with Microsoft technology: http://www.aka.ms/idevthis We’d love to feature yours. Are you comfortable with us showcasing the Eye of the Drone? Feel free to email (frankky@microsoft.com) or respond back here. Thanks for your interest in the contest apmyhr and congrats again on the prize draw win! Thanks for the reminder Kevin. Looks like I'll have a busy weekend! Very interesting article. Have you already written/found some code to get the GPS data and the video from the drone? Else, have you any info on this? I'm very interested in working on this (I'm a c# developer also). Chris, thank you for taking interest in the article. I will certainly be posting code for getting the GPS very shortly. Until then, if you need a starting point, you will be using the GeoCoordinateWatcher class. I also do know how to get video and pictures. My problem with the video though is I'm still not sure how to live stream that to the Azure service. So for now I might just have my app upload periodic pictures. Microsoft Insider has a Windows Phone 10 early preview. You might want to start there. Code for the phone will run on a PC I hear. The release date is not that far away. Actually I see $25 for the camera. But yes, your point is well taken. There certainly are cheap options for getting a camera on a drone. But as you say, its less flexible. I don't know if there are any cheap options for a camera that can feed real time video to a users screen. Thats what I hope to achieve with my smartphone approach. Thanks for the comment. Would it be legal to extend range? Re: Would it be legal to extend range? I don't see any legal implications to extending the range, and I don't see any technical barriers either. All he needs is a server as the "Go Between" for the phone and the controlling device. You could make the phone poll the server for commands, but I would use SignalR to eliminate the need to poll, and it will just push the commands to the phone in real time! I agree SignalR would be a good solution for sending the commands from the server to the phone. However, the big technical barrier that I don't know how to cross at the moment is sending a command from the phone to the actual drone. Maybe there is a quadcopter model out there with a WiFi or Bluetooth accessible API? At the moment I don't think there is a law against it. In fact, I've only recently seen some headlines about proposed regulations of commercial drones. I haven't looked into the specifics of the proposed regulations yet though. However, the ability to control the drone through the phone is still kind of a pipe dream for me. I honestly have no idea where to start with that. Maybe there is a Quadcopter out there that has Bluetooth and an open API or something. For now though, I'll focus on the core functionality of pictures, video, and GPS coordinates. Thanks for the comment!